My kids love to have their faces painted at local arts and crafts events. Wouldn't it be fun if they could do it more often, and without leaving the house?? Now they can with Tulip Body Art. 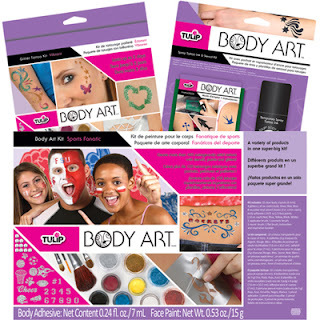 They offer great Body Art supplies including paint, stencils, glitter, sticks and complete kits. 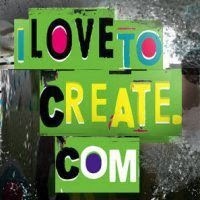 iLoveToCreate has great videos on how to make a variety of special designs on your arms, face and more. The cosmetic grade face paint is a great way for kids (and adults too) to express their creative flare, without having it become permanent. Great for the upcoming Dress Up season as well as plays and skits that the kids may be putting on at school this holiday season. It is fun to dress up no matter what the season at our house! The face paint was easy to use and did not aggravate the skin. Some of the darker colors like blue were harder to get off. They should come off easily with soap and water, but the darker colors seemed to hang on longer. Just a warning if you are planning to take it off for family photos or something, you may want to allow just a little bit of extra time. Enter to win Tulip Body Art! I would love to try the ScreenIt Screen Printing System. I like the Tulip® Body Art® Markers . I would like to try the Body Art Stencils. Thanks for the great giveaway opportunity. Keep up the terrific blogging. 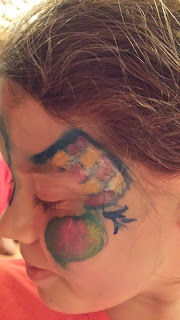 The Body Art Kit would be super fun for my daughter! I think the Tulip® Body Art® Spray Tattoo Ink and Stencil Kit would be cool.